Born in Frecheville near Sheffield on 1st December 1948 and a qualified referee, although he never officiated, started as a player with Chesterfield, turning professional on 31st July 1967. A flying winger, who could play on either flank, he made his debut on 6th April 1968 in a 0-2 home loss to Rochdale and had scored twice in eight starts by the end of the first season. The goals came at Halifax Town on 15th April 1968 in his third game and at Hartlepool United in a 1-2 defeat, eleven days and four games later. In his time at Saltergate he scored twice in twenty-four League games, including four as a substitute, before joining Rotherham United in June 1969. He made four substitute appearances before making his starting debut with the Millers on 4th October 1969 in a 2-1 win at Scunthorpe United in the Fourth Division and became a regular for the rest of the season and scored his first goal in March 1970. He made thirty-eight League appearances, of which five were from the bench, in his first season of 1969-70 and scored three goals. He also made three starts in the Cup and another game from the bench. In his second season of 1970-71 he had a run of thirteen games before losing his first team place and finished scoring twice in thirteen starts and three games from the bench in the League and playing four Cup games of which two were from the bench. He had scored five League goals in forty-six starts and eight games from the bench in the League and five starts and three games as a substitute in the Cup, while at Millmoor. He joined Hartlepool United in July 1971 and made his debut on 14th August 1971 in a 3-1 home win over Reading in the Fourth Division. He had a good season making forty-five starts in the League and scoring four goals and scoring once in four starts in other games. He won the club's "Player of the Year" in a season when Hartlepools finished eighteenth. In 1972-73 he had scored twice in thirteen starts and two games from the bench and one goal in two starts in the F.A. Cup before he left for Third Division Scunthorpe United for £3,250 in February 1972, after playing his final game for Hartlepools on 4th November 1972 in a 1-1 home draw with Aldershot. He scored five League goals in fifty-eight starts and two games from the bench in the League and one goal in six starts in the F.A. Cup while with the Monkey-hangers. He scored seven goals in seventy-two League appearances for the Irons, of which nine were as a substitute, before leaving in March 1975. He joined his only Southern club, when he next played for Aldershot, who were then in the Third Division. He scored six goals in thirty-five starts and two games from the bench in the League. He returned to more local surroundings when he joined Barnsley in October 1976. He scored ten goals in fifty-three starts and four games from the bench in the League while at Oakwell, leaving in May 1978 to join York City. His stay with the Minstermen was brief, according to one book 'Neil Warnock’s brief City career saw him training in his suit on a Friday and sacked as club captain four days later after just one game for City.' He started one game for York and three other games from the bench, but was soon on has travels and joined Crewe Alexandra in December 1978, where he finished his playing career. He scored once in twenty League starts and one game from the bench. He retired in May 1979 as a player in the Football League. He joined Burton Albion in August 1979 before moving to Northern Premier side Gainsborough Trinity as Manager in 1980. He was Manager at Gainsborough Trinity for the 1981-82 season before returning to his previous club, Burton Albion, in July 1982. He stayed for three seasons and in 1983 they won the the Northern Premier League Challenge Cup. He moved to Scarborough in August 1986 and in his first season with them he guided them to winning the GM Vauxhall Conference and promotion to the Football League Division Four, where they took the place of Lincoln City. They finished twelfth in 1987-88 and fifth in 1988-89, but by then Warnock had already departed for Notts County on 5th January 1989. The Magpies finished ninth in that season but it was a sign of things to come as in his three seasons at Meadow Lane he piloted them to Third place behind the two Bristol clubs in 1989-90 and fourth in the Second Division in 1990-91. In both seasons promotion was assured in the play-offs. In 1989-90 there was a 1-1 draw with Bolton Wanderers at Burnden Park and a 2-0 win at Meadow Lane to send them to a Wembley Final with Tranmere Rovers, which they won 2-0 on 27th May 1990 to ensure promotion to Division Two. In the 1990-91 play-offs there was a 1-1 draw with Middlesbrough at Ayresome Park before a 1-0 win at Meadow Lane saw County through to a Wembley play-off Final with Brighton & Hove Albion on 2nd June 1991, which they won convincingly by 3-1 to ensure promotion to Division One. There was only one season in the top flight for County but in a tight relegation struggle they finished nineteenth, just four points behind nineteenth placed Coventry City and five behind eighteenth placed Norwich City. With the establishment of the Premier League the following year they dropped to the second tier which had been renamed Division One. In his time at Meadow Lane he had put together his backroom team of Assistant Mick Jones and his former Assistant and Physio at Scarborough, Paul Evans and Dave Wilson. Despite having rejected the chance to Manage Chelsea and Sunderland, Warnock was dismissed by Notts County on 14th January 1993 and spent time as a consultant to Torquay United from 15th February to 2nd June 1993 saving them from relegation from the Football League, before rejoining his backroom staff as Manager of Huddersfield Town on 15th July 1993. Town were in Division Two when Warnock took over and at the end of his first season they finished eleventh as he put his team together. The following season of 1994-95 saw them finish fifth, which got them into the play offs to accompany the automatically promoted top team, Birmingham City. In the play-offs Town drew 1-1 with Brentford at the McAlpine Stadium and there was again a 1-1 draw at Griffin Park and in the penalty shoot-out which ensued Town prevailed by 4-3. This got them into the Play-off Final at Wembley on 28th May 1995 which Town won 2-1. Surprisingly in his hour of triumph Warnock resigned a few days later on 5th June 1995 and on 22nd June 1995 he took on the Plymouth Argyle Manager's job, with the club having just been relegated from Division Two. He took the club to fourth place just one point off automatic promotion and so once more Warnock was in charge of a team that had reached the play-off stage. They lost the first Semi Final 0-1 to Colchester United at Layer Road but won the second leg by 3-1 at Home Park to go once more to Wembley this time by a 3-2 margin. In the final Plymouth won 1-0 with a goal in the sixty-fifth minute to beat Darlington and claim promotion to Division Two. On 3rd February 1997 with Plymouth in nineteenth position, the club sacked him despite his acheivements and popularity with the fans. He took over as Manager of Oldham Athletic on 21st February 1997 with the Latics in last place in Division One. He was unable to prevent them from being relegated and could only get them to twenty-third on the ladder but only five points away from safety. He set about the task of getting promotion back to Division One but was never on the pace and finished thirteenth. He had never been given any financial backing and he left by mutual consent at the end of the season. He was looking for a fresh challenge and a club to steer to promotion. He was linked with Bradford City, a return to Plymouth Argyle and also Stoke City but in the end on 2nd June 1998 he became Manager of Division One side Bury, who had finished seventeenth and just four points from relegation in 1997-98. Once more he was with a club with no money and had to sell players to exist. At the end of the 1998-99 season Bury were relegated in twenty second place, with the same number of points as the nineteenth club and ultimately were relegated because Port Vale in twenty-first position had scored one goal more than them. On 2nd December 1999, with Bury in thirteenth place and well off the promotion pace Warnock left Gigg Lane to go back to his roots and his boyhood team, Sheffield United. The Blades were struggling in twenty-first place, only two points above bottom club Swindon Town, and by the end of the season had got them to sixteenth. This was followed by tenth in 2000-01, thirteenth in 2001-02 and in 2002-03 he took them to third place and a chance of promotion, via the play-offs. Having already acheived promotion via the play-offs on four previous occasions he would have been disapointed when, after sneaking through the semi-final on penalties against Nottingham Forest, the Blades were easily beaten by Wolverhampton Wanderers in the Wembley Final on 26th May 2003 0-3. It was a season of achievement but also disappiontment when, after knocking out Leeds United in both competitions, they fell to Liverpool and Arsenal in the Semi-Finals of the F.A. and League Cups. 2003-04 saw them in eighth place just two points outside the play-offs. A feat that was repeated the following season, albeit six points outside the play-offs, as the Division changed its name to the Championship. Mick Jones joined the club as Warnock's Assistant at the start of 2005-06 and together they took the Blades into the EPL as runners-up to Reading. The Bramall Lane club performed well in the EPL in what was always going to be a struggle and for a long time it seemed that they would avoid the drop. However, they went into the final day of the season in sixteenth spot, above both West Ham United and Wigan Athletic, knowing that a point would see them safe and relegate the Lancashire team. West Ham were playing at Old Trafford and were expected to lose, while Wigan had to play at Bramall Lane and had to win to save themselves from relegation. Both away teams won, West Ham by 1-0 and Wigan by 2-1 and that consigned the Blades to relegation as Wigan escaped by having scored one goal more than Sheffield in the final calculations. Warnock resigned and took a vacation from football It seemed like he would join Leicester City but ultimately, on 11th October 2007 he took over the reins at Crystal Palace. Palace were nineteenth in the Championship when Warnock arrived and in financial troubles. By the end of the 2007-08 season he had taken them to the play-offs as they finished fifth. They lost the home leg of the semi-final 1-2 to Bristol City at Selhurst Park but by the end of ninety minutes at Ashton Gate they were winning 1-0 and extra-time had to be played. Sadly they conceded two goals to lose 4-2 on aggregate, after extra-time. They finished fifteenth in 2008-09 as their financial problems increased. A ten point deduction for going into administration in late January 2010 which saw them drop from a promotion contending seventh to a relegation threatened twentieth was enough to make Warnock decide he had had enough and he left the club on 1st March 2010, with Palace just goal difference away from the drop zone, to take over as Manager of Queens Park Rangers, who were one place above Palace on the ladder. He signed a three and a half year contract and set about saving them from relegation, which he did quite easily as they finished thirteenth in 2009-10. With financial backing he was able to build a team that topped the Championship for virtually the whole of the 2010-11 season and had clinched the championship an automatic promotion before celebrating it against Leeds United, who spoiled the party by winning 2-1, in the final game of the season at Loftus Road. They settled easily into the EPL and after establishing themselves in mid-table a run of poor form saw them drop to seventeenth, one point above the drop zone after twenty games and Warnock was sacked on 8th January 2012. 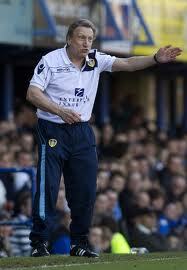 He became Manager of Leeds United on 18th February 2012 on a one and a half year contract. He oversaw Neil Redfearn's final game as caretaker-Manager on 18th February 2012 as Leeds beat Doncaster Rovers 3-2 at Elland Road, speaking to the players before the game and at half-time. His first game in charge was at Portsmouth on 25th February 2012 and it finished 0-0. It took him four games before Leeds scored and registered their first win in a 2-0 victory at the Riverside Stadium on 11th March 2012. Leeds had been inconsistent under former Manager Simon Grayson and in the current season had shown a weakness in defence that saw them leak goals. Nothing changed under Warnock, as they were beaten 3-7 by lowly Nottingham Forest at Elland Road to record their worst-ever home defeat. In early May at the end of the season Warnock drew up his list of retained players and it omitted many players as he looked to use the broom to sweep the former Grayson team and establish his own. Leeds had finished a disappointing fourteenth in the championship and there was the need to revamp the team and Warnock set about it by buying ten new players, Jason Pearce, Adam Drury, Paul Green, Paddy Kenny, Andy Gray Jamie Ashdown, Luke Varney, David Norris, Rodolph Austin and Lee Peltier, who were added to Tom Lees, Luciano Becchio, Ross McCormack and Aidan White with Michael Brown, Danny Pugh and the injured Davide Somma on the fringes. Sam Byram also emerged from the Juniors and then El-Hadji Diouf, Michael Tonges and Ryan Hall, were bought as the season progressed, with Alan Tate, Jerome Thomas and Ross Barkley coming in on short term loan. Most of the not wanted list were induced to leave with only Adam Clayton, Robert Snodgrass and Andy Lonergan raising money. Leeds were never in the hunt and the excuses flowed fast and often but ultimately after another disappointing defeat by Derby County on 1st April 2013, with promotion out of the question and relegation a looming possibility, Warnock fell on his sword. Neil Redfearn took over as Caretaker-Manager for one game at Charlton Athletic on 6th April 2013 until Brian McDermott replaced Warnock as Manager and was in charge for the first time in the Elland Road game with Sheffield Wednesday on 13th April 2013. Warnock did not return to Football Management until 27th August 2014, when, after Tony Pulis had left Crystal Palace, he returned for his second spell with the club. After just three wins in seventeen games under his control, Palace were struggling in the bottom three and on 27th December 2014 he was sacked and Alan Pardew took his place on 2nd January 2015. In 2015 he returned to Queens Park Rangers as first team adviser to Chris Ramsey. He was placed in temporary charge of the club, for the second time, on 5th November 2015, after Ramsey had left. He was only in charge for four games, of which Rangers won two and drew one before handing over the reins on 4th December 2015 to former Leeds United favourite, Jimmy-Floyd Hasselbaink. He was next brought in to replace Neil Redfearn at Rotherham United on 11th February 2016. He started poorly with a draw and then three losses, but an unbeaten run of eleven games saw him win the Manager of the month for the Championship in March 2018 and it was enough to have gained him a contract with Rotherham for the 2016-17 season, but he chose not to. Instead he left his options open for what he declared would be his final season in the Championship. On 5th October 2016 he became first team Manager of Cardiff City. He brought in Kevin Blackwell as his Assistant and then immediately took on former Leeds skipper Souleymane Bamba. The Bluebirds finished twelfth in the first season and then gained promotion to the Premiership at the end of 2017-18. It was his eighth promotion of his career. Along with Assistant Manager Kevin Blackwell and Coach Ronnie Jepson, he has a contract that runs until the end of the 2019/20 campaign.